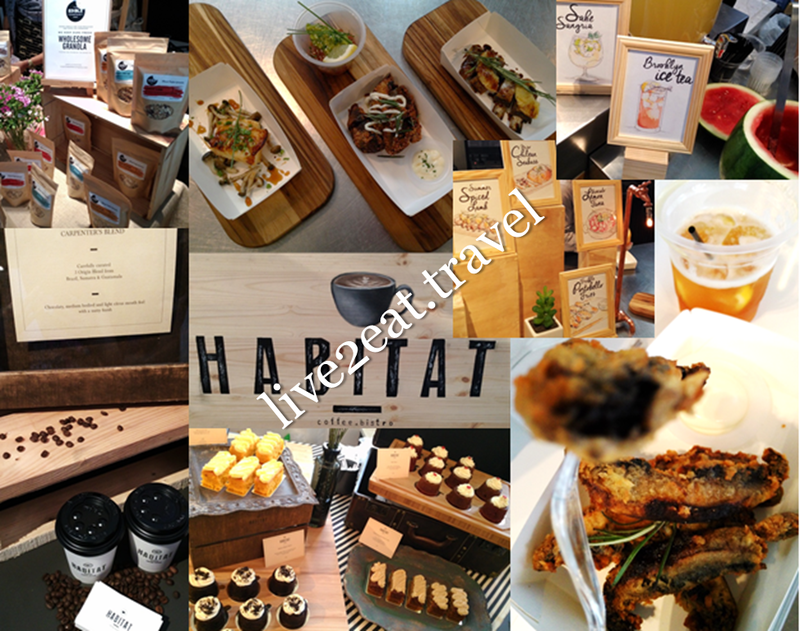 Missed the previous pop-up marketplace by A Perfect Saturday and made sure I attend this one, yesterday. Participants were spread over two levels of APS lifestyle gallery located on 9 Muthuraman Chetty Road. Upon reaching, saw Kerbside Gourmet understandably parked outside the entrance. Offerings from the food truck included bar-chor-mee-inspired sandwiches. Could not wait to step into the air-conditioned indoors where I had samples at Tart Blanc. Its blueberry lavender and raspberry praline tart was well-balanced in taste and texture though the cookies – both the Ginger & Lemon, and Sesame Thins I tried were too sweet. Sampled the Almond, Cashew and Hazelnut Cocoa spreads by The Hunter's Kitchenette too. These all natural nut butters had a smooth and very rich (might be a tad cloying and oily for some) texture with a nutty taste. While I liked the taste of ginger in Citizen Pop's Apple & Ginger, could hardly taste the apple in the fizzy soda made from only fresh fruits and natural ingredients. Some of the wine-inspired tea leaves from A.Muse Projects smelled like the wine it was supposed to resemble, while others still had a stronger aroma of tea . But either way, do not expect to taste any wine in it. GSH Conserves, a local artisanal jam maker, had uncommon flavours like Joo Chiat Mango made with the fruit from that area. Others include Dragonfruit Lychee, Mango Lime and Sweet Potato Ginger. I liked that these deliciously sweet spreads were made in Singapore with seasonal produce from the region to reduce "food miles". Did not like Hic'Juice's cold pressed organic juice and KOT Selections who tried so hard to push its wines early in the day that it was not upfront about having to pay a deposit for the wine glass even as staff suggested for customers to have a drink while they walk around and come back for their second and third if they were getting the bundle deal. Also overheard a customer lamenting how the wine was totally not worth its price. Instead of regular French fries, East 8 served Portobello fries (deep-fried slices of the mushroom) with mayonnaise. And the latter was made with truffle oil which accentuated taste of the "fries". Brooklyn ice tea was a lovely respite from the sweltering heat but found it too sweet for my liking. The Asian Fusion restaurant also had other items on its menu such as Avocado Lemon Tuna, Miso Chilean Seabass and Summer Spiced Lamb. Mojo Chilli had so much spice in its chilli sauce that the other ingredients were overshadowed. Habitat Coffee's espresso was disappointing as the supposedly double ristretto shots was so acidic I cringed with every sip, flat and the quantity was not right. Other merchants include Mandyt Skincare selling bath salts and sugar-based body scrubs, Sushi Burito – a healthy Japanese fast food restaurant which offers freshly-rolled burrito-sized sushi rolls and recently opened a 2nd branch at OUE Link after 100AM, and The Edible Co. which sells homemade granola. 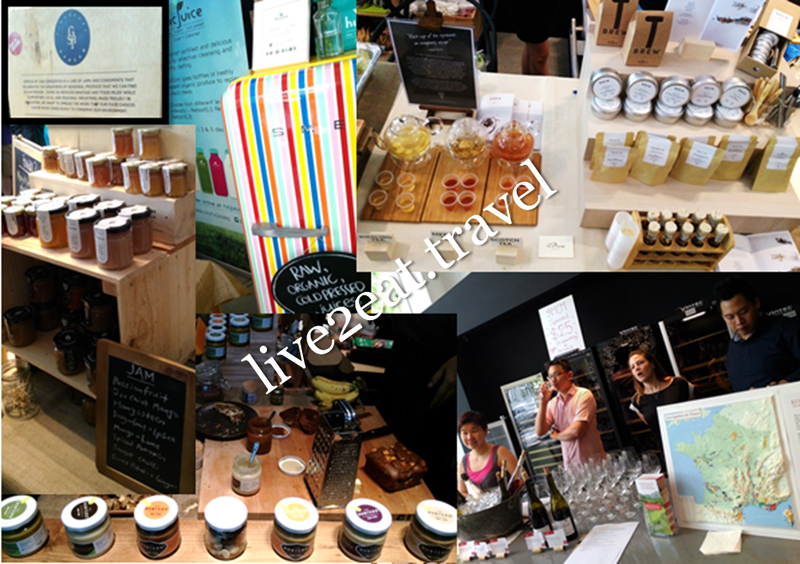 Tags: A.Muse Projects, Citizen Pop, East 8, GSH Conserves, Habitat Coffee, Hic'Juice, KOT Selections, Mojo Chilli, Pop-up Marketplace, Singapore, Sushi Burito, Tart Blanc, The Edible Co.